Web-based e-mail accounts are incredibly useful and convenient--unless you're offline. The first Web e-mail provider to crack the problem is Yahoo with its Zimbra Desktop. The free Zimbra software allows you to connect to an AOL, Gmail, or Yahoo account or to any server through POP or IMAP. When you're online, you have the advantages of an online account--no waiting for the client to send a message to the server or to pull new missives off the server. In the background, Zimbra is caching your e-mail for you to look at when you're offline. Zimbra, which Yahoo purchased last year, was one of the pioneers of Ajax-based Web apps, but its interface is starting to look a little outdated. Most of the information in Wikipedia is completely accurate. Some of it isn't. The problem is knowing which is which--and part of the trouble derives from Wikipedia's mostly anonymous, wisdom-of-crowds approach. If you feel more comfortable getting information from a single, identified source, then Knol, Google's foray into building an online encyclopedia, may (someday) be for you. On Knol, it's obvious who wrote an article--in many cases the author's picture is beside it. And the writer can include biographical information to help you evaluate whether the person knows what he or she is talking about. Knol is promising but young, and its information so far is pretty thin. Greenzer tells you what makes a product ecologically friendly. You probably know that what you buy can affect the environment. But chances are, you don't have the time or the expertise to evaluate whether one HDTV will do more damage to Mother Earth than another. Greenzer.com is a shopping site dedicated to answering such questions. 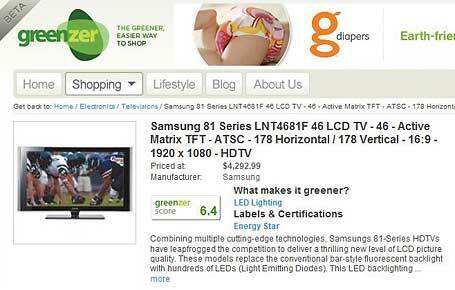 For many products it lists, Greenzer tells you what makes the product green. For some items, particularly tech devices, it also includes a 1-to-10 rating of how eco-friendly the gadget is. And green face-offs provide in-depth comparisons of different kinds of plant fertilizer, for instance.